Hail Damage Repair in Fort Worth, Texas. - Express Dent Inc.
Hail damage often dents the vehicle without causing any paint damage. 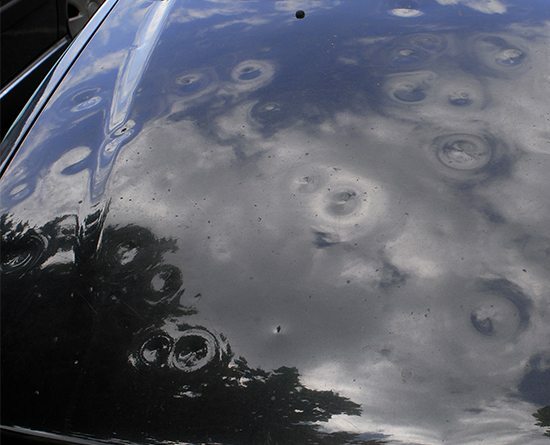 Express Dent Inc. has a vast knowledge of PDR and the insurance business and how to make sure that you are properly compensated for the hail dents on your vehicle. In Fort Worth, Texas we understand the potential devastation of a hail storm. When your car is covered in dents you may feel as if a body shop is your only option to have your vehicle repaired. While in some cases this is true, in most cases you have an alternative – Paintless Dent Repair. With over 15 years of experience in PDR, our team will confidently fix your dents with the latest in PDR technology. We carefully access the various panels of your vehicle through existing openings in the metal. To gain proper access to your hail dents we will likely have to remove your headliner. This part of the process often separates the PDR experts from the rest of the pack, and is one of Express Dent Inc.’s specialties. Taking the PDR skills that have been around since the 50’s and combining it with the technology of today, we have honed our skills to provide a top quality customer experience and quality results every time. How Do I Start The Hail Dent Repair Process? Call your insurance. Before any repairs can be made to your vehicle, your insurance company must assess the damage. They will come up with a value for the total damage and have you locate the shop you want to repair your vehicle. Find a reputable facility. Choose a repair shop that has a good reputation so you can rely on them to stand behind their work. Ask the shop if they drill into the body during the repair. Is the work guaranteed. Know how your body shop will handle any problems you might have with your vehicle after the repair. Get guarantee and contact information in writing. Make sure you are satisfied. Before accepting your vehicle, look at the surface in fluorescent lighting and from several angles so that you can see all the details. Check for any remaining dents before you take your vehicle home.